Want to start some great debates and controversy? Try explaining to a classic Yes fan that without Trevor Rabin, there would be no legendary band to speak of, and Yes would have been relegated to the history books as another mid-level British prog band from the ‘70s that never achieved major success. Obviously, some of you are already outraged, thinking, “What are you talking about? He wasn’t even in the classic Yes band!” But by 1981, that band had already come to an end. 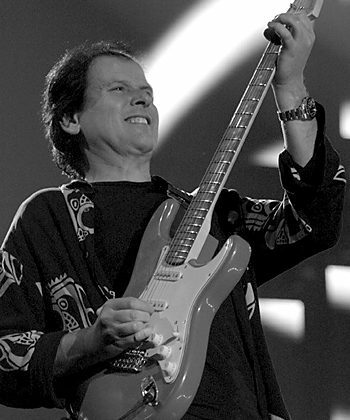 South Africa-born guitarist and classically-trained, multi-instrumentalist, Trevor Rabin, was developing a new band (Cinema) in England with former Yes drummer Alan White and bassist Chris Squire. After Squire played some of Cinema’s material for Jon Anderson, he wanted to get involved with the project, too. As a result of so many former Yes band members being involved in the project, the record label decided the band needed to be called Yes. Former Yes keyboard player Tony Kaye joined the lineup as well, and former band member Trevor Horn produced the music. The ensuing album, 90125, delivered the band multi-platinum record sales and arena tours. 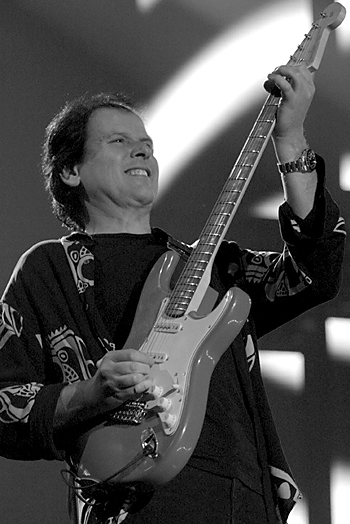 Simplifying the fascinating and complex band history, what came next were a string of successful albums with Trevor Rabin in the guitar and co-vocalist role. Eventually, though, Rabin left the band and released a great progressive rock solo album, Can’t Look Away, and from there he moved into scoring motion picture soundtracks. The soundtrack direction proved to be an ideal match for Rabin’s classical background and keen penchant for writing catchy, melodic music. 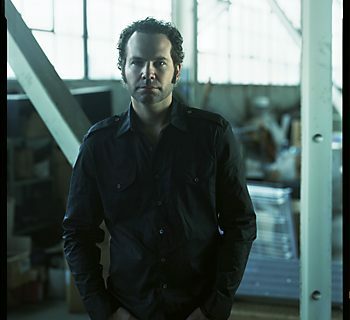 Over the past few decades, Rabin has climbed to the top of Hollywood’s soundtrack “A-list,” scoring major blockbuster films including Armageddon, Gone in 60 Seconds, National Treasure I and II, Remember the Titans, Con Air, and many more. Being in such high demand for film scoring has left fans of the incredibly talented guitarist waiting a very long time to hear something new, but the wait is finally over. 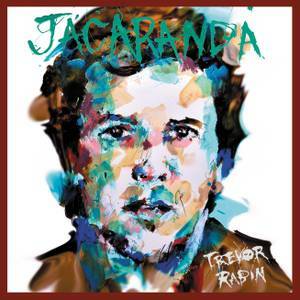 Trevor Rabin’s new instrumental album, Jacaranda, finds the musician in top form on many instruments, though most notably the electric guitar and the dobro. We had a chance to sit down with him and talk about the new album, his work in Hollywood, and, oh yes… we talked about that English prog rock band, too. MPc: It's been many years since your last solo album, Can't Look Away. So, let's start with what inspired you to create Jacaranda. TR: I think after Can’t Look Away, I was very busy with Yes and I was also very busy writing with Roger Hudson, which we didn’t actually end up releasing stuff, but we did do a lot, write a lot of music, which sits there to this day, but then, when I started doing film scores, I was so busy with that. And I had always intended… I wanted to do an album and I had a vague idea of what I wanted to do, and I really wanted to play as opposed to just writing pop songs. But because I was very intense and being very kind of serious about it—not that I wasn’t before, but really focus on it being something that is going to be completely a vision of mine and not influenced or sidetracked by record companies or even other influences—management or band members. And, there really never came the right time immediately after Can’t Look Away or some years afterwards. But I think it was around 2008, I started kind of getting the album together. And I know that, because when I look back at the original files, some of them go back to 2007 or so, kind of in their embryonic stage. But I was doing a movie and then there’d be two weeks available and I’d grab that time and then another movie would start and then I’d have to pick up and try and remember where I was. So, over a number of years, it actually started growing into something that was working for me. And so last year I decided, okay, screw it, I’m taking this year, I’m really going to discipline myself to concentrate on doing this album and getting it done, because I was really getting into it. And so last year I just really finished it, if you like. And I think it’s the happiest I’ve ever been with any record I’ve ever made. I know it is. MPc: I actually noticed familiar names from your previous work, like Lou Molino playing drums on there. MPc: Were those new recordings, or did you dig out old stuff that you guys just hadn't released before? 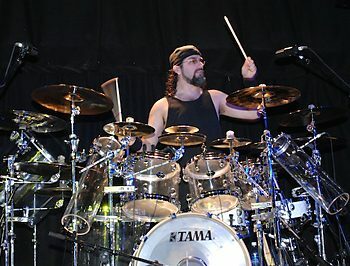 TR: Oh, no, no, and he came and played on the stuff sometime later, as did my son Ryan and [drummer] Vinnie Colaiuta. But, no, none of the stuff was—everything that's on the album was written new, except the one track which was a piece I'd written for the movie, The Guardian, a song called "The Rescue." And I just felt—I really wanted to do a version of that song that was a little different and not as, for want of a better description, score-y. I put guitars around it and rearranged it and did, I think, a better vocal. And I think it worked in the middle of the record. But other than that, everything was written for the sole purpose of this record. MPc: It's so funny, you actually knocked off one of the other questions on my list, which had to do with the song "Rescue" and its relation to The Guardian. Because I swear, I had your new record playing at a reasonable volume in the room and one of our interns heard it from the other room and he came running into the studio and he's, like, "Are you listening to The Guardian?" MPc: I was shocked, mostly because he's a 22-year-old college senior. MPc: And he's into all sorts of typical, modern-day rock stuff. And for him to come in and hear and recognize a movie soundtrack was amazing. And he, because of his age, he really doesn't know you as the guitar player from Yes. But he knew your music from The Guardian. TR: That's quite often the case with film music. People will recognize it, and I remember going to a basketball game and, you know, I wrote the NBA theme for TNT. And the guy I was sitting with—it was a Lakers game, and they play "Remember the Titans." And he said, "Oh, I really, this music, I'd like to get it." He didn't know what it was. And I said, "It's actually mine. I wrote it for the movie Remember the Titans." And he said, "Oh, you're kidding!" And then, when we went to get an ice cream in the lobby, my theme for TNT came up and he said, "I really like this new theme." It was quite some time ago. It's been running now for 10 years or so. And he said, "I like this new theme." And I said, "Yeah, that's me." And I realized that a lot of the music I do for things like that, people might recognize, but they really don't know who it is. MPc: After the Talk album, the last time you were with Yes, how did you get involved in making the switch to film scoring? If I remember well enough, was Glimmer Man your first film? TR: Well, yes, it was actually my second film, because when I was 19, I’d just finished studying with this incredible professor, Walter [Money], who’s recently passed away, unfortunately, just studying orchestration and arrangement and conducting. And I did a movie called Death of a Snowman in South Africa. Might be the worst film ever made, but it was my first score. It was long before MIDI and computers and stuff, so it was really pen to paper. Which, I don’t really do much anymore, because I write it in Performer and then, when it’s all finished hand it off to my copyist and meet them the session. But that was a very different thing, it was called Death of a Snowman, because I wrote it on paper with no timecode or anything like that. And did my own copying for all the instruments and went in, conducted myself and it was… that was really the first movie, but it was a very strange and not a very pleasant experience. But, Glimmer Man was, I kind of consider it my first film. Photo: Ramón de la Rocha. MPc: So what made you go, what took you in that direction after Yes? TR: It was a very specific moment where we were playing, the last show with Yes we played in Hiroshima. I finished the show, it was a pretty good show and my assistant and I, Brody and I went to have a beer at some local pub in Hiroshima. And I just remember saying to him, “I think I’m done.” And he said, “What do you mean?” I said, “You know, I really have enjoyed the time with Yes, but I’m getting to the point where playing live, if I can’t get up and it’s fresh every time, then it’s not fair and it’s not right.” And I decided there and then, I’m done with this. I didn’t think I’d leave the band for ages. I thought I’d take a little break or something and see if the guys were okay with that. But it turned out, I just left. 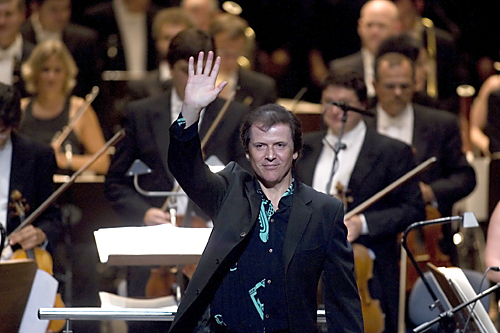 With a very specific purpose—I want to get back to working with orchestra and figuring out where. And I thought a great platform for doing orchestral stuff and visiting all kinds of different genres is film. And when I got back to L.A. I happened to be going to a restaurant with my wife and the maitre d’ came to me and said, “You know, this restaurant’s part-owned by Steven Segal and he knows you come here on occasion. And he said to me, if you ever come in again, to see if I’d be prepared to spend some time with him playing guitar and I guess giving him a lesson or something.” And I said, “Yeah, sure.” And I knew I wanted to do a movie and I thought, well, maybe he’ll have some advice. So I went and did it and once we finished playing for a while, he came to me and said, “Oh, that was great, thank you so much. If there’s anything I can do for you.” And I said, “Well, I want to get into film scoring, so if you have a name of an agent or something, I’m really completely green, I don’t know what to do or expect.” And he just very nonchalantly said, “Well, I’ve just finished a movie if you want to do it.” And I said, “Yeah.” And I really didn’t know what to expect, but I obviously was pretty familiar, especially from Talk, with all the technology, so I was very comfortable with doing it. It was just a matter of, I guess, politically knowing how to deal with the people and just being pretty green and diving into the deep end. TR: Yeah. Well, certainly as an artist, but I did play quite… it's funny, in the early stages of my scoring, I actually did play quite a lot of lead guitar—like Con Air, the main theme in Con Air, although it's a big orchestral score, a lot of times the main theme, which is a lot of French horn and other things, has a lot of guitar, a lot of kind of heavy guitar, melodic guitar. And then the same with Armageddon. And then, Home Grown, which was my second or third movie was a lot of Dobro and gut string and almost bluegrass-y style, bit of banjo. And then Enemy of the State was also quite a lot of techno guitar. But then it started moving a little more towards just pure orchestra. MPc: It's funny, because on some of the older soundtracks, I used to get really excited whenever I saw your name on movies and I could totally hear "Trevor Rabin, the guitar player" in the music you were writing, which was very neat. TR: Oh, cool. That's great to hear. Thank you. MPc: You're welcome. It was interesting, on the track "Market Street," for example, you sound very much like your tone from back on the Yes Talk album. With the new record, did you change your guitar rig much since back in the day? TR: Yeah, quite a lot. I’ve just inherited a lot of influence from doing scores… But, yeah, Talk was a real departure in that I wanted the guitar to be a color rather than just an instrument. I wanted to set it, almost have it as a palette, like you do with an orchestra, but then still obviously have solos and kind of “normal” rock & roll things. And I think that influenced the beginning of how I went into scoring. Exploring what I did, as I did on Talk, led to further exploration in scoring. And I think the scoring really influenced heavily where this album went. Although there’s pretty much no orchestra on it and one of the main criteria for me was everything that came through the door to be on the album had to be a human. MPc: Obviously, on a lot of your more recent scores, all of the stuff you're composing is being performed by orchestras. On the new record, your guitar chops and your piano chops are sounding really top-flight. I'm wondering if you had much work to do to get back into shape? TR: Yes. [laughs] I mean, it’s funny, when I wrote the piece “Killarney,” which is the piano piece, I kind of had it in mind—I actually wrote it and then jotted it down and then I started trying to play it and I realized, “God, it’s in my head, but it’s not on my fingers, I can’t play it.” So I really got into doing a lot of Czerny exercises and there’s a great book of exercises and scales, it’s hundreds of pages long and I went through it like three times in the (about) five weeks I spent really practicing, probably two hours a day on piano and at least two hours on guitar. Because really, I wasn’t in shape to do this album until I really got back into it. Because, while I play on scores, it’s very specific things and, you know, like the theme from Armageddon doesn’t take a lot of technique—speed, I should say. The discipline that’s needed for that is just to play the theme properly and with the right kind of bravado and making the reverb correct, etc. But, yeah, on “Anerley Road,” I had to get my chops back in shape. MPc: That song in particular had some interesting Yes-like overtones. It almost sounds like a hammer-on type of guitar technique that was reminiscent to me of "Changes." TR: Oh, that's all harmonics. I know the part you mean, it's kind of the part that the Dobro sits on top of. MPc: Now, speaking about Dobro, obviously there's a lot of it in this music. When and where did you develop your interest in the Dobro? TR: When I did… well, the first time I started really, I'd been playing it for a while and I loved the instrument, but I hadn't used it a lot. And then when I did—what was it? Home Grown, I used a lot on that. And then on Armageddon I used it quite a lot and I just started really getting into it. And the last six, seven years, I've used it a lot on film and just always used to come in and gravitate to grabbing it and playing and actually trying to find a technique where I could play it comfortably, and get to a point where I could play what I wanted to hear. It's a very different instrument than playing guitar. And now I'm pretty comfortable with it, and just love playing it. MPc: Jacaranda features some different styles of music than some of your progressive rock fans might expect to hear. The song "Freethought" was pretty clever in that you combine some very traditional jazz guitar playing with more of your Yes-era lead guitar technique over the top, which was a really interesting melding of different styles. TR: Oh, well, thanks for that. I just kind of did it. I heard that when it was finished, it was a kind of traditional jazz thing, but had these different genres poking in to the song, saying "let me in"—I know what you mean. MPc: I assume the track "Me and My Boy" is the one on which your son is playing drums? MPc: Can you tell me a little bit about how you achieved your lead tone for the guitar on that song? It was a very modern and unique kind of sound. TR: Well, the opening, very heavy sound was very strange. 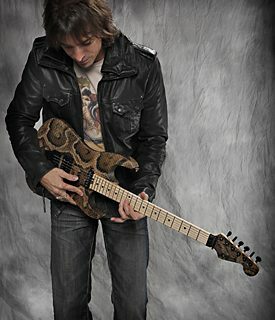 I used—god, I'm looking at it here… A really crappy little Ampeg guitar. I mean, they gave it to me years ago, but I could get this one sound on it—which is that sound, and I developed that part on that sound and that's how the song came about. I just thought, "Oh, this would be a great thing to do." And then, rather than taking that heavy riff and going into a song, I thought, I'm going to take that riff and then move into that riff being done from this heavy thing by just very natural acoustic piano and acoustic guitar. And then work on top of it. And then, when my son came and played on it, he just nailed it immediately. I was very happy with it. MPc: What was your inspiration for the song "Through The Tunnel?" TR: Well, the inspiration for that was I wanted to kind of shuffle in 28, which means basically six triplets and then two-thirds of a triplet at the end, chopping off the last triplet. But ultimately it’s 28 and when Vinnie came to play on “Market Street,” I knew I wanted to do that track, but I hadn’t recorded it. And I wasn’t even finished recording, or formulating it in my mind, or even jotting down—I always jot down ideas and stuff. But I said to Vinnie, “You know what? Can you just give me, like, I don’t know, six, seven minutes in 28 with these kind of fills and these kind of fills and then a couple of specific things.” And he was amazing, he just went and did it, literally, first take. And then I started working the song on top of that. And then areas where I had very specific things I’d have to obviously cut areas where he had a fill which might not have been in the right place. So, once I’d finished doing some of the music, then I kind of just moved around some of Vinnie’s performance and then started working back on the song, once it was really kind of in focus. MPc: On your piano piece, "Killarney," did you record that on real piano or do you use a sample piano, like Ivory, or something like that? TR: No, I have a Young Chang seven-foot grand. I did it on that. MPc: What kind of bass gear did you use for the record? Since most fans know you for your guitar playing primarily, what instrument do you lean on when you go to a bass guitar? TR: You know, there are basically two basses I like to use. As far as four-string bass, I have an old Alembic, which is just—on “Into The Tunnel” I used the Alembic on that. And basically I just plugged it into my guitar amp, which is an Ampeg VT-120, which is the best amp they ever made, and they don’t make it anymore. But my wife said she could hear me from down the road, it was so loud. And you can hear it, it’s really kind of cranked. I love using the Alembic for that kind of aggressive stuff. And then, for the rest of it, on four-string, I have a Wilkins bass, which, I don’t know if you know of them, but they’re just phenomenal basses. It’s my favorite one right at the moment. And then five-string, I mostly use a very old Alvarez 5-string, and a bit of a… fretless is also an Alvarez, when I use a fretless. MPc: Now let’s talk about some classic Yes history. There are very few details published regarding your guitar equipment and how you achieved your tones on the various Yes albums, as well as on your solo album, Can’t Look Away. Can you talk to me a little bit about, what I would say are your recognizable classic guitar tones, and how you achieved those in terms of the guitars, the amps and the effects that you were using? TR: Okay. Well, guitar-wise, I’ve had this—I’ve got a billion guitars, like most guitarists, but the one which I really gravitate to most is my Fender Stratocaster, which I’ve been using since I was, I think 19 years old. 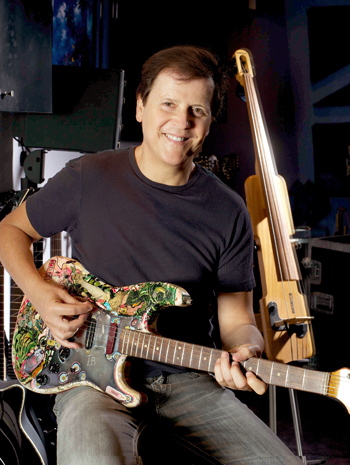 Trevor Rabin portraits in Los Angeles, Calif., on Aug. 26, 2011. MPc: That being the sort of multi-colored-looking one…? TR: Right. Exactly. The guitar’s been through the wars. I mean, the neck was actually broken. I was finishing a show with a band I was with in South Africa, Rabbit, and the show came to the end and I kind of took the guitar off and threw it to my roadie in the wings, just being a cool kind of thing. And he dropped it. Well, it was my fault, I shouldn’t have thrown it to him. It’s one thing doing that a couple of feet away, maybe, but not half the damn stage. [laughs] And the guitar hit the floor and the neck broke. I actually cried for like half a minute, just literally sobbed. Then I went back to Johannesburg, because we were playing out of town and took it to this guy, I don’t remember his name. Greene, I think his name was. And he was the guy to go to to have your guitars set up or changed or fixed. And I said, “You’ve got to fix this neck.” And he took the neck and it took him, I think it was eight months before he gave it back to me. So, while that was going on, I actually put a Telecaster neck on my Strat and lived with that for a while. And then got used to it. But when my neck came back and he fixed it, it was fantastic. That’s still the same neck and, if you look at it, you can see the crack all the way through, the complete break, which he fixed, which I don’t know how he did it, but it’s great. So that’s the guitar I used a lot. And then I have a signature model I did years ago with Alvarez. And those are pretty much the two main guitars I use. For the jazz—well, you’re talking pre-Yes. There’s a couple of things, like the solo on “Changes,” the kind of jazzy-sounding tone, is a guitar I used a lot on this album. It’s a Gibson Barney Kessel, which I use a lot. But for the main, kind of heavy, sound, it’s mostly a Fender, my Strat or my Alvarez. MPc: Does your classic Strat have stock Fender pickups or is it a pretty hot-rodded Strat? TR: It’s hot-rodded. I’ve got other Strats with the original pickups. I still have the original pickups, but there’s a Bill Lawrence… oh, god, what’s the other one? [Maybe a] DiMarzio. MPc: And what were the amps that you were using during the Yes '80s period? TR: For 90125, it was pretty much, I had a 100-watt Marshall which I loved, and a very specific one, which I still have to this day, it’s just the best Marshall, to my ears. And I had a 50-watt Marshall, which has since been stolen, but the 100-watt is what I did 90125 on. So that was that. But one I got a couple of years later, I started really getting into—Chris Squire was using Ampeg and I tried some of the guitar amps, which I just… the VT120s, which I fell in love with and use to this day. MPc: Obviously, effects like delays and harmonizers are key ingredients in your tone. So can you tell me a little bit about the effects that you use? I feel like there was either a Korg STD 2000 or 3000 in the rig. I’ll tell you, players are so desperate to know what stuff you used! TR: Well, that’s funny, you recognized correctly. For the 90125 tour, it was very much, the delay was an MXR 1500, which is absolutely my favorite, but it’s not very sophisticated, so I’ve stopped using it in the guitar rack. But it’s still in my studio. 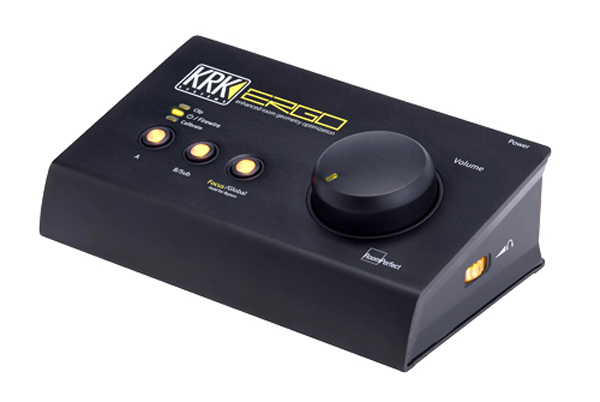 It’s such a beautiful… you know, it’s an old MXR, it was great. The harmonizer I used was actually an MXR harmonizer. But that’s in the early days. Eventually, once, I got into Ampeg and got into using the [Bob] Bradshaw rig, which I’ve had—I’m on my third one from him, he’s great, I changed from the MXR, because there just wasn’t enough variation and manipulation and I went into the Eventide, which I used until quite recently for harmonizing and some weird effects. I also moved on from the 1500 to… I had two delay units, which were Korg delay units. I think—is it the 2000? MPc: Yeah, the 3000 was the flagship and then there was the 2000 at a lower cost. TR: Yeah, I think it was the 2000 I used. You could tune down, you could put a real lo-pass filter on it, so the delays, as they decayed, they would lose the top end, which I really like. I think you’re right, it was the 2000. And I played in stereo, so I had two of those, one per side. And I didn’t have a reverb unit at that point. I used an MXR compressor, which I still use—I think it’s the Dynacomp. What else did I use? Stereo chorus and… Yeah, MXR stereo chorus I used. And then I used the Roland distortion, the kind of orange guy. MPc: Oh, that was the DS-1. TR: Yes, yes. And I still use that to this day. And then I had other little things. But that was pretty much it. My rig at the moment—oh, and I also had a Rane MIDI graphic EQ, which was great, because I could go—in the Bradshaw rack, you have the programs and I would have the whole show in the programs and each program, each song would have five or six different presets. And each preset I was able to really zone in and each preset had a different EQ. So I still use the Rane today. Right now I’m using a TC Electronics G-Major for the harmonizing and the reverb. The rack’s right in front of me. G-Major. And then the Rane equalizer. Then I’ve got in the rack the Line 6 Filter Modeler and the Echo Pro. And I’m probably going to move away from that… The Echo’s really good, but just the sound of the 2000 are something I preferred. And certainly the sound of the 1500, but you just can’t manipulate the 1500 enough. And the weird thing with the 2000 is it went to 64, so it was in, I think it was in eighths. So what was channel 9 on my pedal board was different in the Korg, so it was a bit weird. We had a graph saying “this number equals that number on the pedal board,” so it’s one of the weird things. But it worked really well, so I might go back to those 2000s. I’ve got to find them, they’re somewhere in the warehouse. MPc: Your favorite 100-watt Marshall, is it a multi-channel head or is it a single channel? TR: Yeah, it’s just a two-input and it has just normal—there’s a preamp and a master volume. MPc: So, you probably received a copy of it, maybe a year or two ago, they finally released the Union tour concert DVD. And what was really interesting in going back and watching that was observing that Steve Howe was especially uncomfortable sharing the stage with you. We’re just curious what your memories are of that particular tour and whether or not everyone really had a good time or was it an awkward situation for everybody involved? TR: Well, the beginning was a kind of acoustic rhythm part, right? And, obviously, before the Union Tour, it’s parts I would play and, when we got to do the Union Tour, it was, well, you know, certain things… you do that, I’m not. But I had nothing to do. So I started kind of doing… when Steve was doing that rhythm part, I started doing kind of “For those about to rock.” You know, the [hums the guitar riff], you know that part? The AC/DC song? TR: I started doing it just for fun. And I got this look from Steve of absolute horror. Like, “What are you doing???! !” kind of thing. And I looked at Rick—it all happened in two seconds and Rick burst out laughing. And because Steve looked with horror, I thought, well, I’m going to do it every night. As a joke. TR: He wanted to annoy and tease Steve. But yeah, nothing ever bothered me on the tours as far as personalities. I’m pretty thick-skinned, so I really didn’t care. But, clearly I got on great with Bill and got on great with, fantastically, with Rick. As far as the new guys, obviously all the other guys I was friendly with. As far as Steve, we started off kind of fine and I guess, I wouldn’t even say drifted apart or anything. Everything was fine. It was just I think, I became very close friends with Rick and spent a lot of time with him, so I guess with Steve, it’s just I didn’t spend too much time with him. We kind of sat together on a couple of flights and played every night together. And he was perfectly fine. He never did anything malicious, he was always very respectful to me. But, yeah, visually it probably looked a little awkward, very different, aesthetically very different people. Played very differently. MPc: Skipping to the album following Union, how did you achieve that strange lead tone that happens about 4 minutes into “The Endless Dream” on the Talk album? TR: Oh, the kind of, what I call the elephant noise? Well, it’s all guitar. I think, if I remember correctly, what I did—well, it’s just a very nasty sound with a very short delay. And quite a lot of room sound. And I think what I did is, I kind of in pretty much Pro Tools, I harmonized it. Some of the sounds, I changed, like a tone down or something? I transposed down a tone. And then transposed it back up a tone. So the nuances and stuff that screws up the sound when you do that really gives this incredible weird tone. So, it lands up in the same key, but in order to achieve that, have got to transpose it, which screws up the sound a bit and then transpose it back. MPc: How did you develop your flat-picking technique for acoustic guitar? In particular, I have noticed an Al Di Meola influence, especially on that new little sample you just threw up on your website this summer. TR: [laughs] Oh, yeah, that was—Oh, I got this new Martin, which—it was amazing, because I was doing a TV thing at the Guitar Center and it’s really early in the morning and they were setting up, and so there’s a million guitars on the walls and there’s no one else there, so I was just picking up guitars and playing them. And I’ve played a million Martins and I didn’t have one and never really thought I needed one, and then I just picked up this one guitar and it was like, “Oh, my god, this thing’s unbelievable.” And I said, “I’ve got to have this.” I said, “I’m not taking it now, but I’m going to come pick it up in a couple of days. So that’s where that came from. MPc: Cool. Finally, you alluded to your long-time friendship with Jon Anderson. I recently did a feature story and had a conversation with Jon, and he also mentioned how you’ve been in touch over the years. I’m wondering if, now that perhaps Jacaranda has really rekindled your love of rocking out a little bit, have you guys thought about moving forward, possibly doing something new together? TR: Well, actually, Jon, myself, and Rick Wakeman have been talking about doing something for quite a while, and the enemy has been time. We just haven’t had… our time hasn’t lined up together, but I met with Rick some time ago and met with him in London and we had a long lunch and talked about doing it. And we will at some point, and I think it’s getting closer, because we know if we don’t do something, it’s just not going to get done. But we’re very excited about doing something.